Any yarn that is 100% wool and will felt. Instructions given to make a variety of sizes. 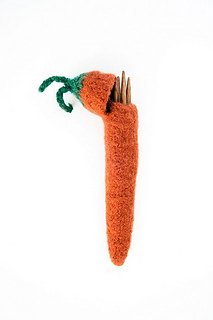 This little carrot holder is a great scrap buster since it takes only about 20- 25 yards of yarn. Perfect to use up all those little bits you have laying about. 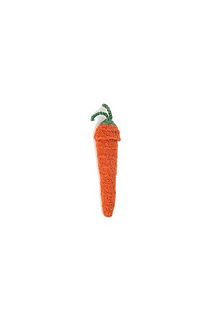 They’d be a great little gift to make for someone who likes to knit of just whip one up for yourself. They take about an hour to make. I got tired of my double pointed needle sets getting lost in the bottom of my knitting bag and them not being all together so I just started knitting one up. 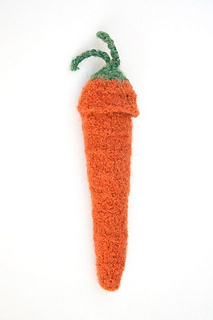 First I made my pea pod case and then decided to make this carrot case to go with it. I also made a corn cod so there’s a whole garden of cases to choose from. These are knit from the bottom up and the caps are attached so they won’t get lost. You must use 100% wool yarn to make these since you do felt them after you knit it up. Do not use superwash. I tried it really doesn’t felt!!! HA! 20-25 yards of yarn- mostly orange but about 2 yards of green or any color combo you want to make it in. A darning/yarn needle to weave in ends. Some elbow grease to rub it together and felt it when you’re done knitting. A crochet hook- any size from C-G.